* Click on the links for the print outs. Print all the graphic elements out before you start. It works best if you can print the ‘magic box’ graphic on cardboard. If you can’t print on cardboard, glue the printout to an A4 sheet of cardboard. Using cardboard gives the box a little bit more stiffness than just using paper. 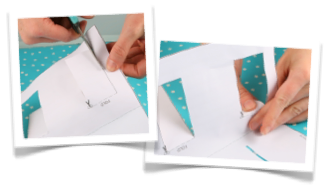 Ask a grow up for help with cutting the ‘doors’ and slits in your ‘magic box’ printout. Cut along the solid black line that makes the outline of the ‘magic box’ graphic where you see the scissor symbol. Cut the two slits in the back of the ‘magic box’ as shown on the magic box graphic and in the picture. Now cut the bamboo effect out. This will be the front of your ‘magic box’, just like a real life ‘Cutting a Lady in Half’ illusion. Cover the back of the bamboo effect paper with glue. It needs to stick down flat without any bubbles. 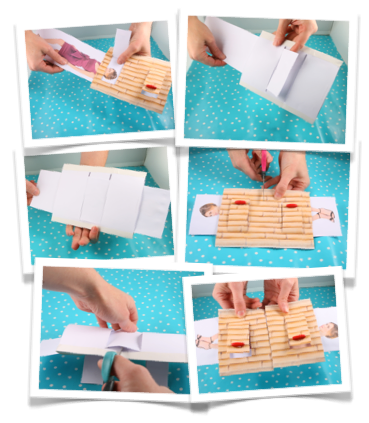 Glue it to the non printed side of the ‘magic box’ paper. Make sure that it is matching up with the ‘front of the box’ on the reverse side. Don’t stick it over the slits you’ve cut in step 3. (See pictures below). 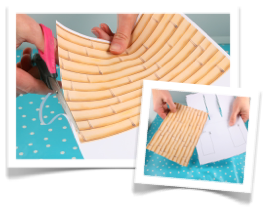 Cut the bamboo effect paper that is sticking over the edge of the box off like shown in the picture. Now it is time to cut the ‘doors’ in your box. Cut along the solid black lines as shown to make two flaps. DON’T cut the doors off. Fold the doors on the dotted lines. Fold your ‘magic box’ on the dotted line that is running across the middle of the graphic. You are only a few steps away from completing your ‘Cutting a Lady in Half Magic Box’. Using masking tape, stick the bottom front edge to the bottom back edge. (See pictures below). You now have a sleeve. Stick masking tape over the folded edge as well to make it look the same as the bottom edge. 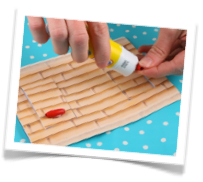 Glue a couple of buttons or beads on the ‘doors’ of the ‘magic box’ for extra effect. You can use stickers or draw handles should you wish. Fold the ‘lady’ graphic in half along the long edge. Cover the inside with glue and stick down. 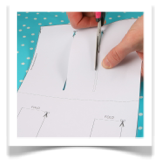 Trim the edge off along the dotted line. You have your ‘gimmick’ for ‘Cutting the Lady in Half’ magic trick. Slide your ‘lady’ into the side of the ‘magic box’. What the audience doesn’t see is that the ‘lady’ weaves through the slits in the back of the ‘magic box’. Getting ready to cut the lady in half, the audience sees the ‘magic box’ and the ‘lady’ being cut in half. The audience doesn’t see the scissors avoiding the ‘lady’ and only cutting through the ‘magic box’. Ta-Da! You have done the ‘Cutting a Lady in Half’ illusion! Please send a link to the magic box and bamboo printout for the cutting a lady in half trick. Please send a link for the lady and bamboo box. It is not with the instructions. Nice illusion…Whos the cutie with you? your daughter?